By day, she scrubs floors, cleans houses, washes dirty linens in the river. By night, she paints. She is Séraphine, a cleaning woman in her fifties. Later, she is better known as Séraphine de Senlis. 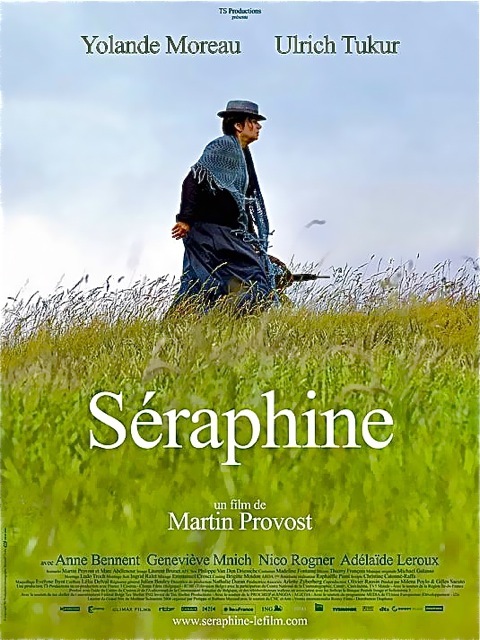 Séraphine (2008), a film based on the life of the early 20th Century French painter Séraphine Louis (1864-1942), won 7 César Awards in France including Best Film of 2009 and Best Actress for Yolande Moreau as Séraphine. True to its subject matter, director Martin Provost has crafted an aesthetically pleasing work of art. The pace is slow for the viewer to savour every bit. Moreau’s charming portrayal of Séraphine is captivating. She wins my heart from the first scene. It is gratifying to be noticed, to be confirmed of one’s worth. To the dismissive eye, an ageing cleaning woman is nothing to deserve another glance. Makes me think of the concierge Renée in The Elegance of the Hedgehog. In one of the apartment units which Séraphine cleans, a new tenant just moves in. He is Wilhelm Uhde, a noted art critic and collector of Picasso. 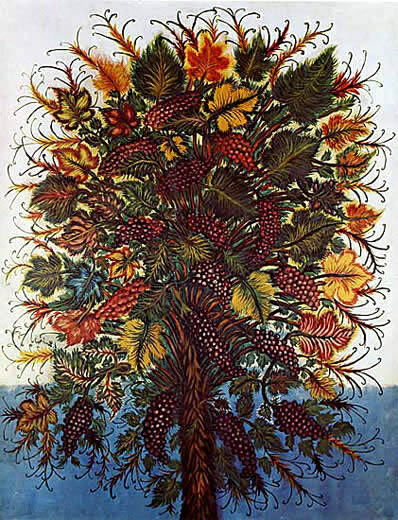 He is also the one who has discovered Henri Rousseau of the naive art style, a term referring to untrained talents, a term to which Uhde doesn’t subscribe. And right there in his rental unit Uhde notices another hidden gem of this style, his own housecleaner Séraphine. Uhdle is deeply moved by her work and soon becomes her patron. He stops her from mopping his floor, leads her out into the garden, seats her down in a wrought-iron chair and tells her she has talent. It is a wrought-iron chair that I notice since that scene, and it recurs later in the film, a metaphor for aesthetics, style and elegance, antidote to the crude reality of Séraphine’s life. Séraphine loves nature, and nature rewards her with inspiration. 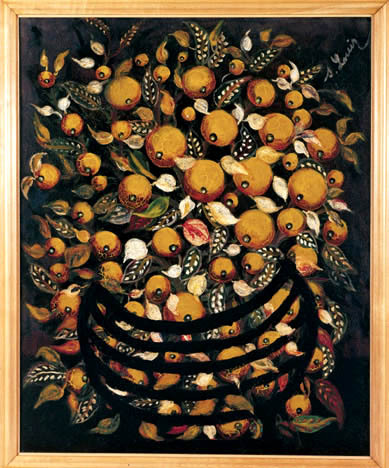 Her subjects are mainly flowers and fruits, their design exquisite, natural, colourful and lively. Deep religious fervour soon drives Séraphine to relentless, maddening obsession to paint. She claims to follow voices from her guardian angel. She would sing hymns at the top of her voice while painting through the night, waking up in the morning on the floor with her work-in-progress. She gradually becomes delusional and out of touch with reality. Why is it that giftedness and mental illness often find affinity for each other? Van Gogh comes to mind. And only recently did I read this Guardian article drawing uncanny similarities between Séraphine and Susan Boyle. As WWI draws near, the impending conflicts push Uhde out of France and back to Germany. They reunite after the War. Sadly, the painter’s growing achievement brings about more severe delusions. Later the economic depression ends contact between patron and artist for a while. When Uhde finds Séraphine some years later, she is locked up in an insane asylum. This latter part of the movie is a bit uncomfortable to watch. Uhde is unable to communicate with her as she is restrained in a straight jacket, tied to the bed weeping in anguish. Months pass and in 1935 Uhde visits her again. He needs to tell Séraphine her paintings are selling. Her condition has stabilized by now but upon doctor’s advice, Uhde should just leave her be. There in the asylum at Asile de Clermont Uhde quietly pays for her a private room with a view out towards a lush green meadow and full, leafy trees. Séraphine slowly gets up and opens the door. She sees a wrought-iron chair on the porch. The frame on screen here is roughly split in two. On the left side is her room with a sterile, wooden chair of the asylum. On the right we see the porch outside with the wrought-iron chair, not unlike the one she had sat on while being declared a talent by Uhde years before. She tentatively steps out of her room, touches and examines the chair, then picks it up and slowly carries it with her up a green hill to a full, beautiful tree. From afar, we see her look at the tree, put the chair under its shade, sit down and tilt her head back, fully relaxed. In the silence with just the wind blowing, it seems we can hear her gratified sigh of relief, being back in nature, coming home. CLICK HERE to watch Séraphine’s official trailer on Youtube. You’ll be able to see the ending scene. But of course, nothing compares to watching the film in its entirety. A NOTE ABOUT MOVIE PHOTOS: These images are used according to the Fair Use guidelines for criticism, comment and educational purposes. CLICK HERE for more information. CLICK HERE to read the Report of the Ad Hoc Committee of the Society For Cinema Studies, “Fair Usage Publication of Film Stills” by Kristin Thompson. This movie review is my third post for Paris in July hosted by Karen of BookBath and Tamara of Thyme for Tea. To read my previous posts you can click HERE and HERE. Arti, this sounds amazing, getting all my passions together at once — art, film, nature, the period. Thanks. I’ll try to find it at our local video store! I have never heard of this artist before. Her work is striking and beautiful and the film sounds good too! She belongs to the ‘naive art’ style, a term referring to the untrained, self-taught artists. I think in recent years there’s a new term ‘outsider art’. Anyway, sure blurs the boundary and redefine what art or an artist is. It’s been on my To Watch list. It was a big success here in Belgium as well. I’ve a feeling that films like this may well be more popular in Europe than in N. America. That’s why we’re missing out on a lot of fine productions. Like to know what you think of it after you’ve watched it. Arti, thanks for this review. I reviewed the same movie last year – although your review is much more eloquent. I enjoyed this movie alot, and reading your review brings it back to me. I’d love to see it again. I just love the way it depicts the conflicts between the societal values placed on people and the internal value one has. Her passion and love of paintaing as her dedication to God was admirable. 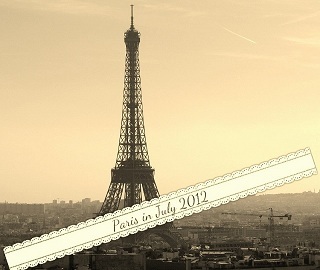 Welcome to Paris in July 2012, and thanks for the review. Welcome! Thanks for hosting this interesting blogging event. I’ve been looking out for things French and Parisian all these weeks… As for this film, it’s regrettable that in Séraphine’s case, the line between religious fervour and delusions is so difficult to decipher. I’d love to read your review if you could leave me with the link to your post. This sounds just the sort of movie that I’d love. I’ve never heard of the movie, or the artist before either. Will definitely keep an eye out for it. 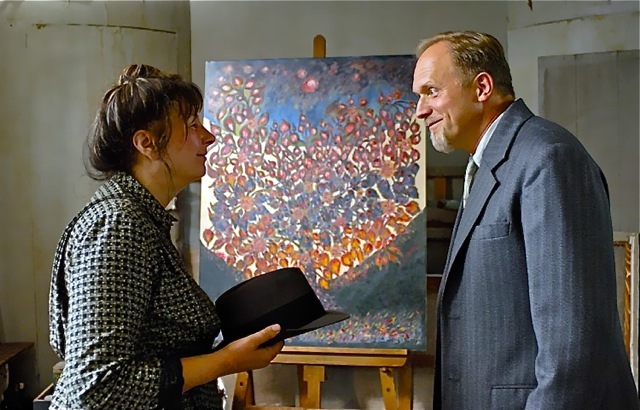 It is a foreign film for us North Americans, in French, needs subtitles that is, and about an obscure middle aged cleaning woman who’s also a painter… that’s why we wouldn’t have the film in our cineplex theatres, or being shown in many cities. Anyway, I’m glad as JoAnn (Lakesidemusing) said it’s on Netflix. Hope you’ll have a chance to catch it. I’ve never heard of Séraphine Louis, or of the film. 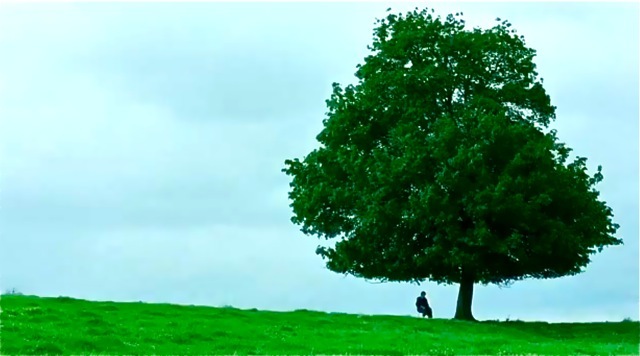 Of course you know what the final photograph reminds me of – our beloved oak tree! Apart from issues of creativity, artistic inspiration and the thin line between genuis and insanity, your review also points to a real fear I share with many aging people – getting cut off from nature. Without property to cling to, I’m already thinking of ways to keep myself out of an institution of any sort! How I’m going to do that, I’m not sure. But this film certainly makes the point that a relationship with the natural world is necessary for happiness. I looked at the offerings in our theatres over July 4 – my goodness, they were terrible. I’m so glad that you point us toward some alternatives that can be entertaining and artistic! Of course, the great oak tree. Yes! And, the power of nature. You’ve mentioned a valid point. Not only for older folks, but for anyone living in urban centres, in high rise apartments… kept away from Nature. That’s why urban parks are so important to our well being, esp. for those who can’t get away so readily. Summer movies are usually fantastic blockbusters. I got this DVD out from our public library, which is my source of off-screen movies nowadays. Hope you can find it in yours too. What a fascinating life. And you’re so right about giftedness and mental illness. Or genius in one area of life balanced by inability to cope in another area. And for Séraphine, it has religious overtones, like she’d be hearing voices of the angels… etc. and later totally lost in her delusions. It’s sad to see she could not live out her potentials or simply enjoy life a bit more But the ending scene does bring some comfort. I have *never* heard of this film and it sounds exactly my kind of thing! Thank you for such an inspiring review. Welcome! Yes, do try to find this one. I know it’s on Netflix. I got mine from the public library. I’m sure it’s not hard to find a copy. Hope you like it. And do come back to share your thoughts. I haven’t heard about this movie, but it looks terrific. I’m putting it on my list. It’s a little gem hidden away here in N. Am. Hope you’ll enjoy it. Oh, Arti, I must see this film! Thank you for making it known. ds, I’m sure you’ll enjoy it. Do come back and let me know when you’ve seen it. Wow! This is fascinating. Thanks for the review – I hadn’t heard of this and now it’s definitely on my To See list. How amazing that it was Uhde who moved into that building and not, for example, some art snob! Eugenia, Welcome! Yes, I’m sure you’ll like this film. Have you read The Elegance of the Hedgehog? This film has some parallels to that novel.